Take some fashion cues from a sticky-sole river shoe, sprinkle a dose of design direction as per the current barefoot/minimalist footwear zeitgeist, and add heavy some field-test feedback from a Jesus Christ lookalike and ultra-runner wonder named Anton Krupicka, and you will have a shoe called the MT10 Minimus Trail. That’s the gist of New Balance’s light and flexible new trail runner, a $100 shoe so different from most of the market that it regularly gets mistaken as an aqua sock. It is made of rubber and mesh. Twist the shoe and it wrings hard like an old, thick rag. You can wear it sockless. There is no insole and scant midsole padding — leap on a stone wrong and you’ll get a bruise above a foot bone. Further distinguishers: The Minimus’ toes are not articulated like a Vibram FiveFingers shoe, though the New Balance sole hales from the same Italian sole-maker (Vibram), and in spite of no “toes” it is almost as strange: A grid of textured dots web a rubber sole that I found somewhat wondrous for running on pavement as well as dirt. There is a term circulating in the shoe world as of late, “zero drop.” This means there’s no angle or downward slant from a shoes’ heel area to its toes. Bulky, old-school or “normal” running shoes have large drop measurements (12mm or more); the latest “barefoot” shoes have zero drop, as per the term, and they run more like you might run without shoes on at all. New Balance does not jump on the zero-drop train. Its Minimus Trail has 4mm drop from heel to forefoot. It is perfect, in my tests. I am an advocate of some drop, I guess, as this shoe just feels right. Other models I am testing, including the similarly hot Merrell Trail Glove, have zero drop, and the running experience, for me, is not as good. The foot fall is more harsh, which slows me down and fatigues me quicker. The New Balance company line on all this is that its design team believed that “building great minimal footwear is more than just stripping as much as you can out of a shoe, or making a lightweight shoe and calling it ‘minimal.’” Smart! I agree with that. The takeaway? The Minimus, which is touted as “anatomically correct” and “natural movement”-encouraging, grabs some of its makeup from results seen on a treadmill in a test lab. 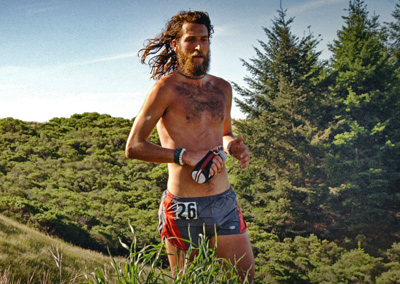 Oh, and a fair bit of feedback from that dude running in the mountains that looks like Jesus. Why go minimal at all? A shoe like this can make you a better, stronger runner if you’re fit and willing to try something new. If it’s a problem (and it is with many, many runners), a shoe like the Minimus will help you correct your gait and stop landing on your heels with each stride. You’ll develop a quicker cadence and land more flat-footed, like you would if you were running without shoes on (and like nature intended, as per the current industry thought). The Minimus Trail is a great entry into the barefoot/minimalist footwear realm. It is flexible and does not manipulate your stride. I feel fast in the shoe, despite its “drop” and despite its not-so-light weight: My size 12 Minimus is 9.3 ounces — light, but not unusually so. For $100, the Minimus shoe is worth a try. It comes in a men’s and a women’s build. The odd aqua-sock design? It’s included on both models, each gender allowed to enjoy the commentary and the confused looks received as this one-of-a-kind shoe strides on by. previous:Power Pack: Equal to 70,000 Batteries!